Educators from several African nations were among the 2,500 attendees to participate in Applied Scholastics International’s grand opening and weekend workshops, where they cracked the newly-published Study Technology texts. 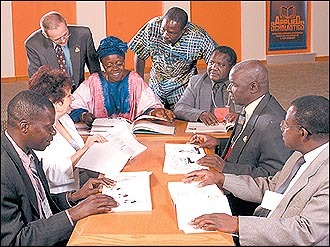 Little more than a year from that initial decision, on Saturday, July 26, 2003, Slaughter’s core group of Applied Scholastics International staff stood shoulder to shoulder with others from around the world who are also steadfast in their dedication to improving the quality of education. More than 2,500 educators, government officials, corporate executives and area residents joined them to participate in the opening of the new Applied Scholastics International Headquarters. Adding to the excitement of the day was a host of celebrity supporters to help officially open the center’s doors. Actors Tom Cruise, Jenna Elfman, Anne Archer and world-renowned musician Isaac Hayes joined the Member of Congress representing the Spanish Lake area in the U.S. House of Representatives, the Secretary of State for Education of the Gambia, and an advisor to the Danish Ministry of Education for the ribbon cutting ceremony. 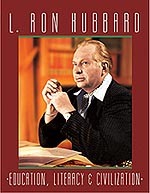 L. Ron Hubbard noted, “As long as children and young men and women find pleasure in study, they will continue studying throughout life — and upon that depends their happiness.” Through 35 years of research he discovered the real reasons a student gives up on study and developed methods that help the completely illiterate and the gifted but bored student alike. Read about these discoveries and how to apply them to get real results in education. Order the book, L. Ron Hubbard: Education, Literacy and Civilization today. The new Applied Scholastics campus in Spanish Lake is there to make these methods broadly known to the hundreds of thousands of educators in schools and universities around the world who are so desperate for a solution to today’s educational crisis. Under the direction of Slaughter, Applied Scholastics’ new facility will train teachers, corporate trainers, mentors, tutors and education consultants from around the world, supplementary to their existing education with Mr. Hubbard’s precise system for learning any subject. “It is not that educators are unwilling or unable to teach,” Ms. Slaughter told her grand opening audience. “It is a matter of a missing link between their teaching and the comprehension of their students. And it is not that students are unwilling or unable to learn. It is a matter of the gap in their education — the subject of study itself, their very ability to learn. “There has never been a central training center. It was all happening one-on-one — the technology being passed from one person to the next. So this center is a first, and it is exclusively dedicated to training educators at every level: tutors, mentors and teachers — those who deal with these problems on a day-to-day basis. The campus’ curriculum includes workshops and courses ranging from educational basics all the way to advanced teaching strategies and methodologies, as well as several continuing education courses and postgraduate credits. Applied Scholastics is an educational organization that licenses private schools, community literacy centers and tutors utilizing humanitarian and philosopher L. Ron Hubbard’s teaching and learning methods. The organization has trained more than 64,000 teachers and educators internationally since 1972. And the need for this technology has never been greater. With literacy rates plummeting in America and worldwide, today there are millions who are functionally illiterate, unable to compete in the workplace and only partially capable of leading productive lives. Mr. Hubbard developed study technology in the 1960’s when he saw that declining educational standards were profoundly affecting the learning abilities of people he was attempting to instruct. His investigation into this phenomenon, and his research regarding the basic laws of education, led to a revolutionary development in the field: a technology of study that anyone can use, as student or teacher. As educators throughout the world learned of Hubbard’s breakthroughs, they began to utilize them in their own work, thus forming the roots of what is now Applied Scholastics. To date, more than 3.4 million people have been helped through Applied Scholastics worldwide. Mr. Hubbard’s study technology is used in programs conducted by more than 415 educational organizations in 54 countries on six continents. Today thousands of teachers in universities and school systems use this advanced technology of study internationally.